Fabbity is a leather based brand which has pretty home decor items, which are really helpful when it comes to organising your room or office. Desk organisers for your office desk and cosmetic organisers for your dressing table. Fabbity's got sleek, stylish pieces that are minimal and make your life so much easier. 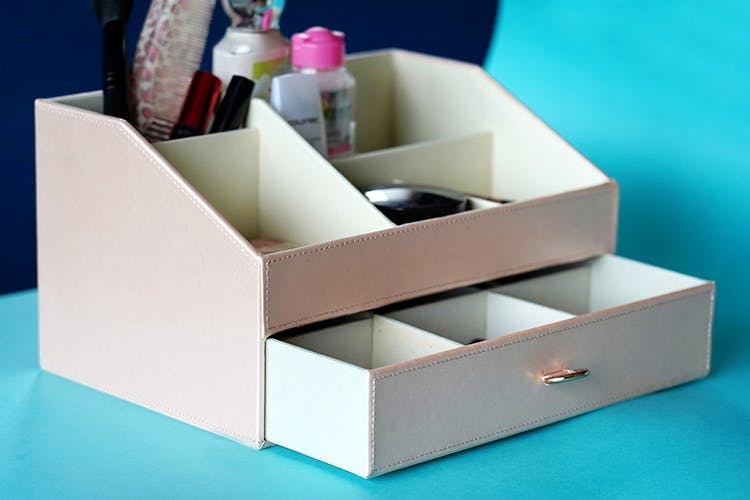 If you're literally the Monica of your group and can't stand messy spaces, Fabbity's got a bunch of leather accessories you'd love .They've got coasters, trays, ashtrays, charging stations, tissue boxes, car pocket organisers, waste bins, diaries and calendars for work or your home.What we really love are their organisers. Our top three picks would be their desk organiser for your office, store all your stationery and reminders in one place, they've even got a little tissue holder in there. The sunglass organiser is perfect for anyone with too many pairs, you won't have to hunt for the particular one your outfit needs that day. The other one we love is their cosmetic organiser, it's so stylish and comes in this pale gold colour, close to champagne. It's got plenty of rooms for all your make up, with enough drawers and compartments to fit everything in. You can use it for your jewellery as well. They offer decent discounts on their products, so keep checking their sale section if you're interested in a particular item.